Salt Lake Community College is currently hosting an exhibit that displays the potential of its visual art and design alumni. 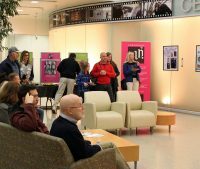 The opening reception for the fourth annual INK Alumni Art & Design Group Show took place Friday night in the Edna Runswick Taylor Foyer at South City Campus. The event showcases the work of former SLCC graphic design students, with an emphasis on showing the process of designing a work from conception to finish. “What we’re trying to show with our alumni is that they’ve gotten a good foundation in graphic design and that our graphic design students can go anywhere and do anything,” says Kerry Gonzáles, an associate professor at SLCC and “caretaker” of INK. Gonzáles says anything that anybody works with has to have a graphic designer involved somehow. 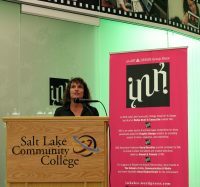 INK initially started as a club at SLCC, but soon became an online hub where graphic design students can stay up to date on industry news, events and job opportunities. Gonzáles took on the role of managing INK in 2012 when the students who had created it graduated. Since then, she’s introduced the annual Alumni Art & Design Group Show into the composition of INK. The event featured the works of eight alumni that help illustrate the process of designing a piece of work. The six of the eight alumni that were present gave a brief description of their careers or experience in this domain since graduating, as well as an explanation of the process designing their displayed work. Among the works displayed at the event was a visualization of the design process for a public art project by Amy MacDonald and team. The public art project, titled Confluence, is a sculptural representation of the Red Butte, Emigration and Parleys creeks that meet with the Jordan River. It is planned for installation along the Jordan River Parkway in September 2019. Another designer, Tanja Rigby, showcased her process for designing a logo for a dance apparel company. Multiple times throughout the night, Gonzáles hammered home the idea that relationships and networks between students, professors, and careered individuals was of high priority. “Myself, I have a Facebook account that’s totally for alumni and that’s how I keep up with them. I try to post something at least once a week in INK, so everybody sees what everybody’s doing,” says Gonzáles. The artwork from the Alumni Art & Design Group Show will remain at the Edna Runswick Taylor Foyer until Jan. 11, 2019. Graphics produced by SLCC alumni hang on display before the 2018 INK Alumni Art & Design Group Show reception Nov. 16 at South City Campus. Graphics produced by SLCC alumni hang on display as guests wait for the 2018 INK Alumni Art & Design Group Show reception to begin Nov. 16 at South City Campus. 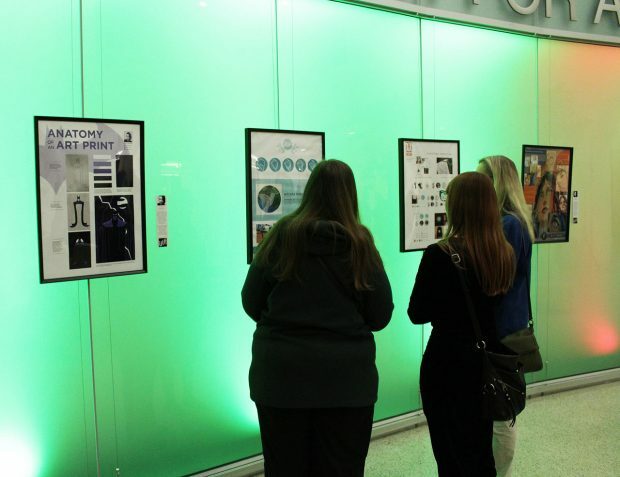 Attendees view the graphic designs on display at the 2018 INK Alumni Art & Design Group Show reception Nov. 16 at South City Campus. INK caretaker and SLCC associate professor Kerry Gonzáles, at podium, introduces the artists in attendance for the 2018 INK Alumni Art & Design Group Show reception Nov. 16 at South City Campus. Artists, from left to right: Tanja Rigby, Ian Maxfield, Katrina Parkinson, Amy MacDonald, Helen Cox, and Melissa Hurd. INK caretaker and SLCC associate professor Kerry Gonzáles, at podium, introduces the artists in attendance for the 2018 INK Alumni Art & Design Group Show reception Nov. 16 at South City Campus. Artists pictured: Tanja Rigby and Ian Maxfield. Attendees of the 2018 INK Alumni Art & Design Group Show reception Nov. 16 at South City Campus. Former SLCC graphic design student Katrina Parkinson addresses the audience during the 2018 INK Alumni Art & Design Group Show reception Nov. 16 at South City Campus. Parkinson is one of nine alumni who is having their artwork featured in the Edna Runswick Taylor Foyer. 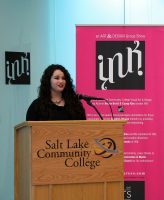 Former SLCC graphic design student Amy MacDonald addresses the audience during the 2018 INK Alumni Art & Design Group Show reception Nov. 16 at South City Campus. Parkinson is one of nine alumni who is having their artwork featured in the Edna Runswick Taylor Foyer. Former SLCC graphic design student Helen Cox, at podium, addresses the audience as INK caretaker Kerry Gonzales listens during the 2018 INK Alumni Art & Design Group Show reception Nov. 16 at South City Campus. Cox is one of nine alumni who is having their artwork featured in the Edna Runswick Taylor Foyer. Former SLCC graphic design student Tanja Rigby stands next to her project at the 2018 INK Alumni Art & Design Group Show reception Nov. 16 at South City Campus. Rigby is one of nine alumni who is having their artwork featured in the Edna Runswick Taylor Foyer.